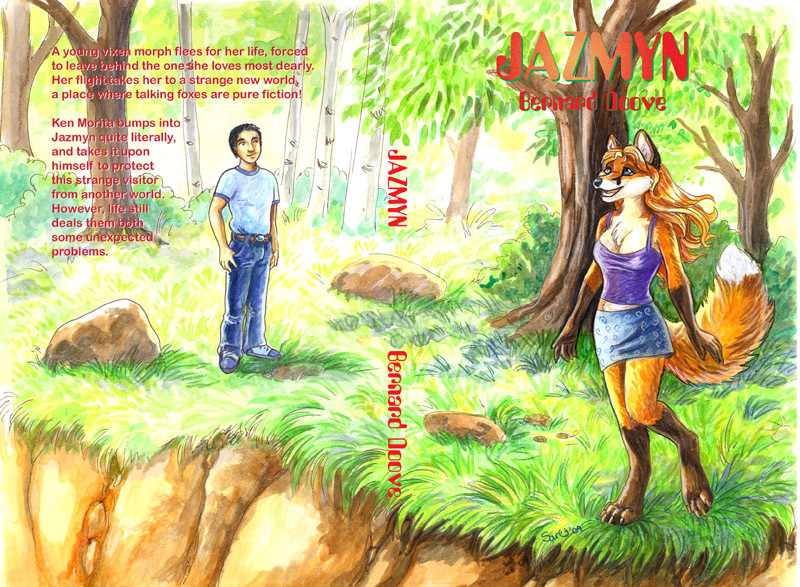 Jazmyn, a bioengineered vulpeen (fox-woman) Companion in a parallel world, is fleeing into the forest after the murder of her human lifemate when a lighting flash enables her to stumble into our world. She is glancingly struck by the car of Ken Morita, who nurses her back to health, teaches her English, falls in love with her, and they get married and live happily ever after. No, seriously. There are plenty of interesting and well-written details between page 7 and page 214, but that is the basic story. 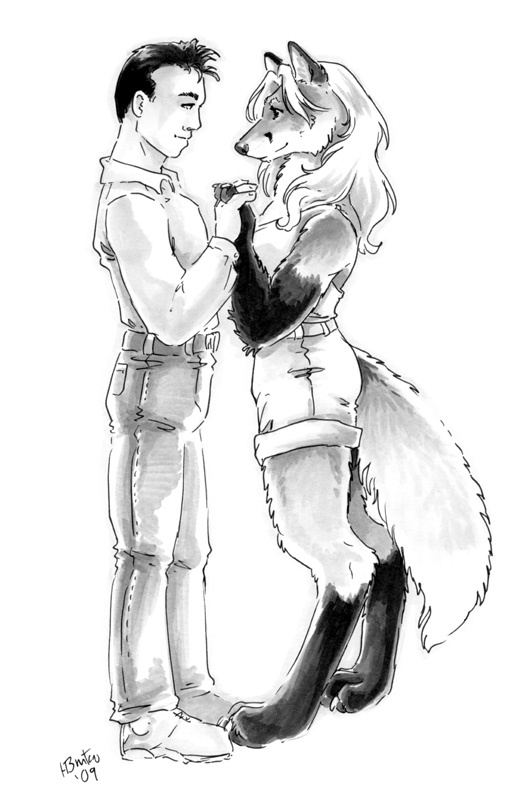 You can hardly imagine a more pure Furry wish-fulfillment novel: a beautiful, caring, talented human-sized fox-morph comes to our world, falls in love with [you], and they get married. CreateSpace, April 2009, trade paperback $16.95 (215 pages; illustrated). All else is incredibly fortuitous window-dressing: Ken, a young Japanese-American, is a computer programmer who lives in an isolated mountain house, so he has no inconvenient neighbors when he brings Jazmyn home and spends weeks nursing her back to health and teaching her English. Jazmyn was bred to be super-talented at languages to help her Companion, so she not only learns English unbelievably quickly, she also picks up on computer programming language so she can help Ken with his work. Ken’s Japanese ancestry makes him and his sister Sakura particularly prone to trust “kitsune”. (This feels false. In Japanese mythology, kitsune are Trickster fox-spirits who can be helpful, but some of their tricks on humans are Not Nice.) Ken has a dream job; he can commute from an isolated home, take weeks off and phone in his programming from home, and is the best friend of the boss. Ken’s sister and his boss are momentarily startled when they meet Jazmyn, but within minutes they are all very friendly and pledged to keep her secret. Doove creates a very minor problem every few pages, and quickly solves it. 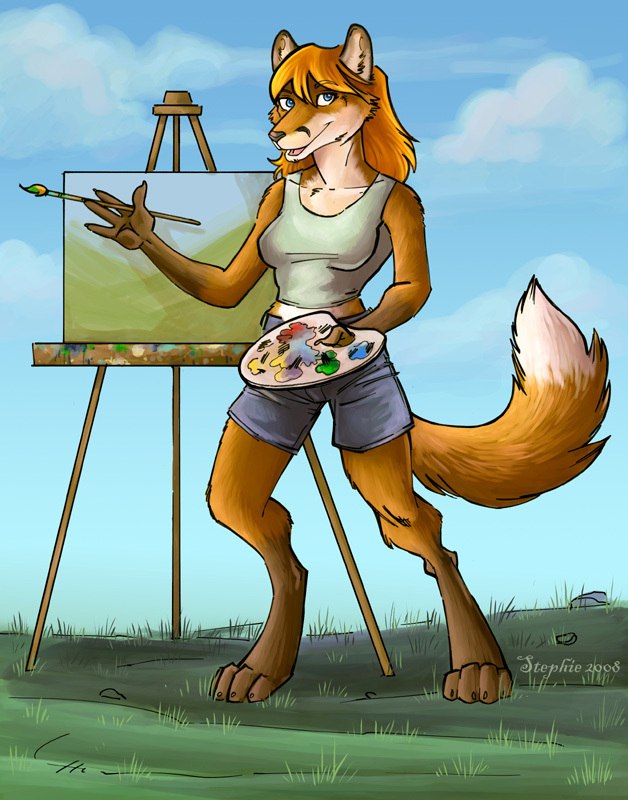 Jazmyn is collected from Melbourne Furry fan Doove’s “Chakat’s Den” website, where it appeared as eight episodes during 2008. The story concludes with the “End of Year One”. A sequel is implicitly promised, and four more much weaker episodes did appear on Doove’s website during 2009 and 2010, but the story seems to have stalled at this point. Jazmyn is not part of Doove’s Chakat universe, and it is free of the sexuality of those stories. It is well-illustrated by Kacey Miyagami, Dark Natasha, Stephanie Stone, Doove himself, and several other artists, as is usual for Doove’s stories, with an attractive wraparound cover by Sara Palmer. 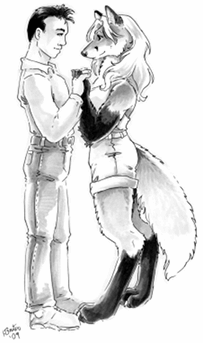 If you are looking for a well-written undramatic human-Furry romance, with the emphasis on ROMANCE, look no further. Oh, that dialogue... it sizzles with romance! Was that quote specially picked for badness, or could there possibly be hundreds of pages of the same? Not to toss too much sarcasm at something innocent, positive, and fun (for the writers and nice illustrators)... but it brings to mind worse crimes against writing like the ones they make fun of here and here, hahaha. No, I chose that quote just to show that Ken and Jazmyn do get married after the book full of will-they-or-won't-they, and to show how they get married without letting anyone else know of Jazmyn's existence. Since, as I said, nothing much ever happens in the novel, quoting the dialogue in any other scene would be realistically banal and rather pointless. The fact that nothing much happens in Jazmyn makes it bad according to the rules of writing novels. But, in real life, most romances are pretty banal. They progress from dates to engagement to a wedding without complications from foreign spies or terrorists or bank robbers. So Jazmyn is sort of frustrating because the reader keeps expecting that something dramatic will happen and nothing does. But it is not badly written, the dialogue is realistic if unexciting, and there is a happy ending. Bad dialogue? Well, like I said, banal dialogue, but I didn't see anything particularly bad about it. It is not overly florid; certainly not as bad as Dan Brown's. I liked about seven-eighths of it in spite of that, though -- it had something of the feeling of an episodic adventure rather than a novel: rather than a building plot you have a series of small crises and resolutions. But the event that precipitates the marriage of Jazmyn and Ken is way off in WTF territory -- after spending that much time establishing Ken's character, he goes off and acts completely at odds with it! In the space of a few paragraphs he goes from absurdly lucky to eminently slappable, just to set up the very abrupt resolution. Grr. Grr, I say. Grr. I wrote Jazmyn as a feel-good story - nothing more. I never claimed it to be my best, nor a very dramatic work. There's certainly nothing wrong with "feel good" stories, and I wouldn't want to imply otherwise. I don't think Fred implied otherwise, either. But, it's certainly worth pointing out the relative lack of tension in the review. I do think there are still some issues even as a feelgood story in that a lot of things resolve too quickly: in particular, it seems to miss out on the potential of the pairing to have Jazmyn essentially learn English overnight and to have come from a place geographically identical to where she ends up. I found the most charming parts of the story the part where they were trying to reach out to one another, and was a little disappointed to have that end so abruptly. 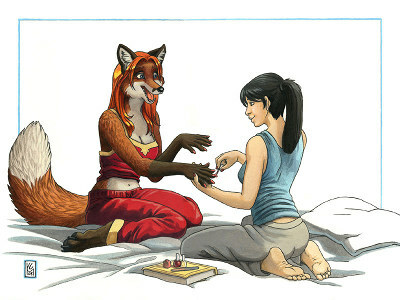 I have been reading the unfinished sequel or "part 2" on Goldfur's Chakat Universe website. It seems markedly inferior. Too much coincidence, and a very unconvincing attempt to inject suspense into it. If you're referring to Kayde, Doove admitted that he got a couple of chapters into it and his inspiration dried up. Since he didn't want to either force out a story when his muse was elsewhere, nor leave it hanging incomplete, he wrote an ending that brought what he had written so far to a resolution, resulting in a story of a modest four chapters. I think Doove would be the first to admit it wasn't one of his better works.